We Drink Your Milkshake! 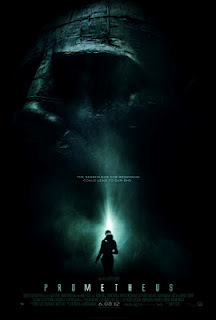 : Full PROMETHEUS Trailer Drops! Okay guys. I can't remember being this pumped for the summer movie season for a long time. Either it's going to be a fun filled summer of great movies, or these trailer companies are getting better with making kickass previews. Now, WonderCon is going on right now (think of a smaller Comic Con), and we got a great trailer that premiered there yesterday. We've had teasers and teasers of teasers for Ridley Scott's newest film, PROMETHEUS, over the past couple months, but thankfully now we have a full trailer that gives sheds a little more light on story and gives us some great visuals. Wow. Just the aesthetic of the world alone is worth going to see. Consider myself even more pumped. Again, either the best summer of movies in recent memory or the trailer editors are becoming masters at their job. PROMETHEUS comes out on the best of days June 8, 2012, directed by Ridley Scott starring Charlize Theron, Michael Fassbender and Noomi Rapace. I kind of wish we never knew about the connection to the alien franchise though. I'm not sure if that knowledge is setting a more positive or negative frame of mind for the future viewing of this film. Not meaning that it will force a positive or negative view on the film, but that whether or not my state of mind will be more accepting to the story that is to be presented, as opposed to looking for the connections to the story I already know.